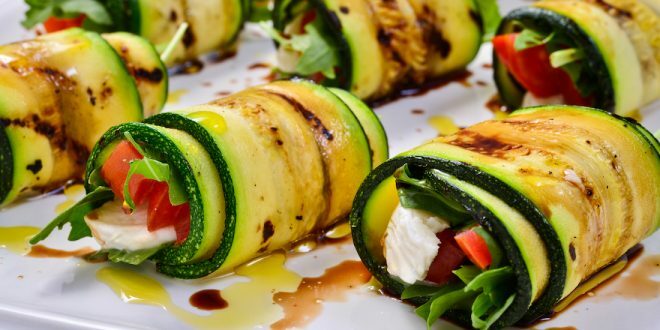 Zucchini rolls with cherries and Traditional Balsamic Vinegar of Modena. Would you like something a bit different, which tastes amazing and which is diet friendly at the same time? You’re in the right place! Read more to find out all the steps. Here we are with a new, light recipe that will help you to stay in shape while totally enjoying what you’re eating! 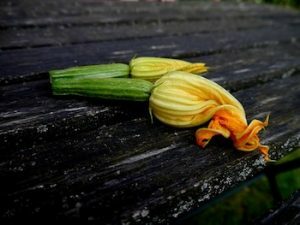 The first steps you have to take is clean the zucchini, chopping off the ends, and slice them in strips, maybe with the help of a slicer or potato peeler. Eventually, you should have long, thin slices. Secondly, take 50 g of cherries and cut them in small pieces. Then mix them together with goat cheese, one spoon of Traditional Balsamic Vinegar of Modena, one spoon of olive oil, salt and pepper. Then, arrange three slightly overlapping slices of zucchini on a worktop and pour a scarce spoon of the mix. Roll it up delicately afterwards, in order to create a proper roll. Repeat this operation until you’ll have 12 rolls. Brown the remaining cherries in a non-stick pan for some minutes, then add Traditional Balsamic Vinegar of Modena, let it simmer at medium-low heat and stirr often, until you’ll get a syrupy consistency. When it’s time to serve the rolls, arrange them in the single plate, decorating with cherries flavoured with Traditional Balsamic Vinegar of Modena and that’s it! Another important thing is that this plate is glutenfree, so within the reach of all. We definitely suggest to try it, because it could really surprise your guests, as it is something a little different from what you may eat on a daily basis, but at the same time it is super easy to make. Last but not least, zucchini rolls with cherries and Traditional Balsamic Vinegar of Modena is a very light and healthy plate! Enjoy and let us know how it goes.